MANCHESTER, N.H. — New Hampshire&apos;s Kelly Ayotte, the last Senate incumbent to face a primary this year, easily outpaced her opponents Tuesday. With more than 90 percent of the state&apos;s precincts reporting, Ayotte picked up almost 80 percent of the vote. Her victory means that every Senate incumbent will have won their primaries in 2016. Her main opponent was former state Sen. Jim Rubens, who&apos;d attacked her for supporting the Gang of Eight&apos;s immigration reform legislation. Rubens lost a 2014 Senate primary to former Massachusetts Sen. Scott Brown, who later lost to Sen. Jeanne Shaheen in the general election. He raised only $28,000 during this year&apos;s pre-primary reporting period, much of which he donated to his own campaign. Ayotte had been running a general election race for months. During last week&apos;s primary debate, she often responded to Rubens by pivoting to attacks on the Democratic nominee, Gov. Maggie Hassan. 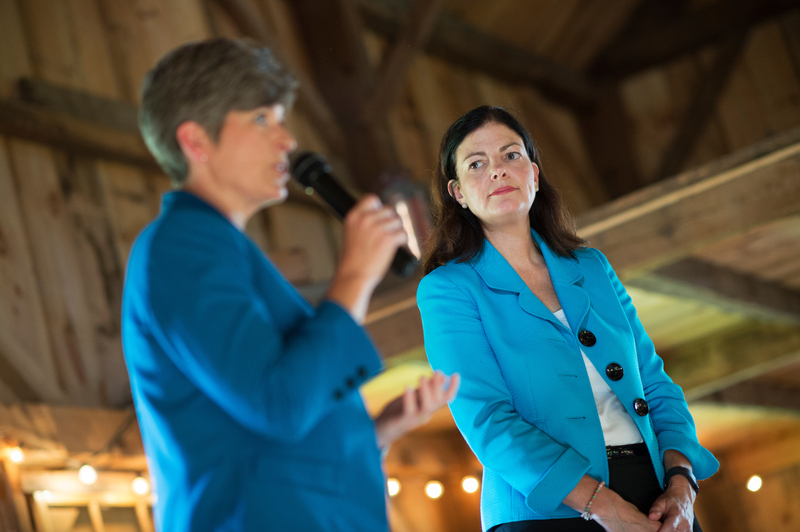 On the trail this weekend with Iowa Sen. Joni Ernst, Ayotte again stuck mostly to her general election message, but she reminded supporters she needs them to turn out on Tuesday. The weekend before the primary wasn&apos;t all about campaigning. Ayotte, 48, spent Saturday morning doing what she often does when she&apos;s home: running a 5K. A former competitive skier and biker, Ayotte&apos;s known for her athleticism. She plays on the congressional women&apos;s softball team and was the fastest female senator in the ACLI Capital Challenge three-mile race in May. Running became a form of activity she could squeeze into her schedule after getting married and having two kids, Ayotte said. While her road races are nonpolitical, running them increases her visibility — and that&apos;s good for politics. That&apos;s one reason an underfunded primary challenger has struggled to gain traction: People know Ayotte. As she ran through Manchester&apos;s residential streets, cops, race volunteers and spectators waved, often shouting, "Hi, Kelly!" And she often knew them, too — or at least she pretended to. Like everything else political in New Hampshire, campaign signs are giant. Ayotte ran by larger-than-life signs bearing her name, and plenty for her Democratic opponent, too. But Ayotte wasn&apos;t interested in counting lawn signs. 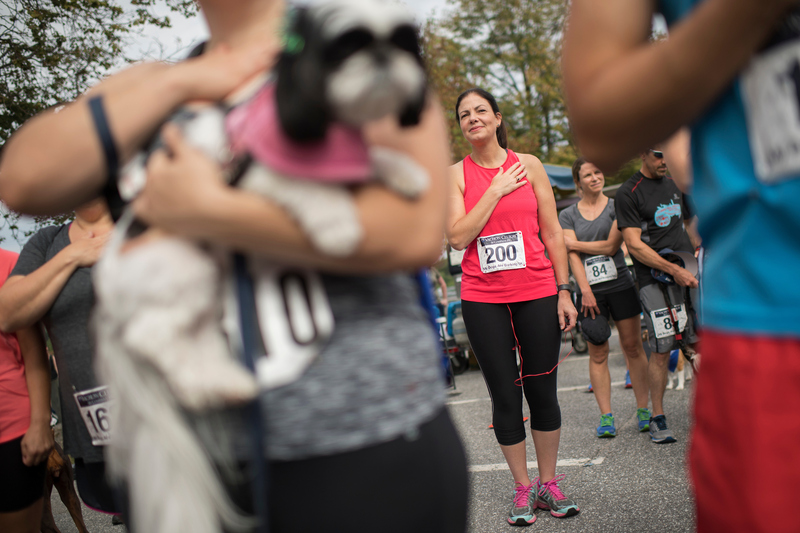 As two- and four-legged runners (proceeds benefited the Animal Rescue League of New Hampshire) passed her, Ayotte stayed focused, always looking straight ahead. The freshman senator leans into her races, driving herself forward with a long stride. When the sun broke through the already oppressive humidity, Ayotte plowed on, reassuringly whispering "OK" under her breath with each increasingly exhausting stride. Her running playlist is similar to her campaign one, with Pharrell Williams, the Script and Queen making appearances. And of course, "Shake It Off" by Taylor Swift — "every candidate has to have that," Ayotte said. Ayotte&apos;s strategic. She knows that stopping for water at the halfway point is worth it (this reporter stupidly did not). Instead of starting out too fast, she conserved some energy for the final, grueling hill (again, this reporter did not). She finished in 28 minutes and 53 seconds. She&apos;s expected to have plenty more energy reserved for the sprint to the general election, one of the tightest match-ups in the country.